They say you can’t visit Sedona without hiking at least one of its numerous trails. And we must agree with that. Sedona, an Arizona desert town near Flagstaff, is covered with scenic walking paths. From the popular Cathedral Rock hike to the easy Bell Rock hike, the city has many ways to test your endurance and athleticism. We had only half of the day to spend in Sedona and thus limited our options to hiking the Devil’s Bridge Trail. 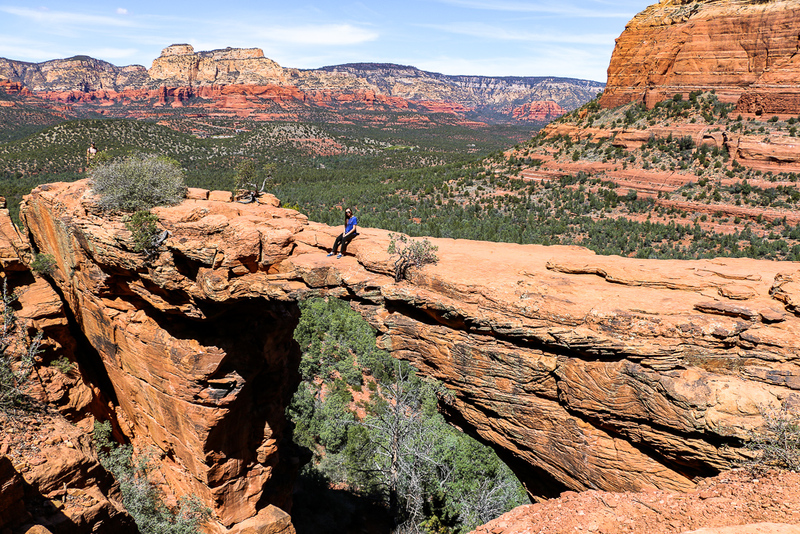 Devil’s Bridge Path is one of the most popular hiking trails in the Sedona area. The hike entices with gorgeous scenery of Red Rock country. The trail is rated as moderate. However, some portions are very steep and require extra caution. The Devil’s Bridge Trail is accessible all year long. You can also hike with your dogs, but must keep them on leash. 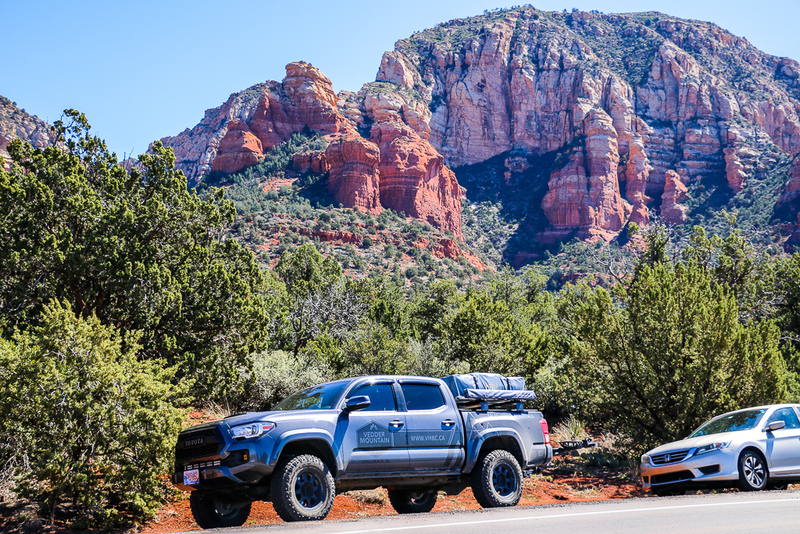 Parking can become a serious issue when hiking the Devil’s Bridge Trail in Sedona, Arizona. The place has decent parking lot. But the amount of people hiking the Devil’s Bridge Trail usually exceeds the number of parking spaces. The rest of the hikers have to leave their cards on the side of the road. On the weekends, the place typically gets extremely busy. 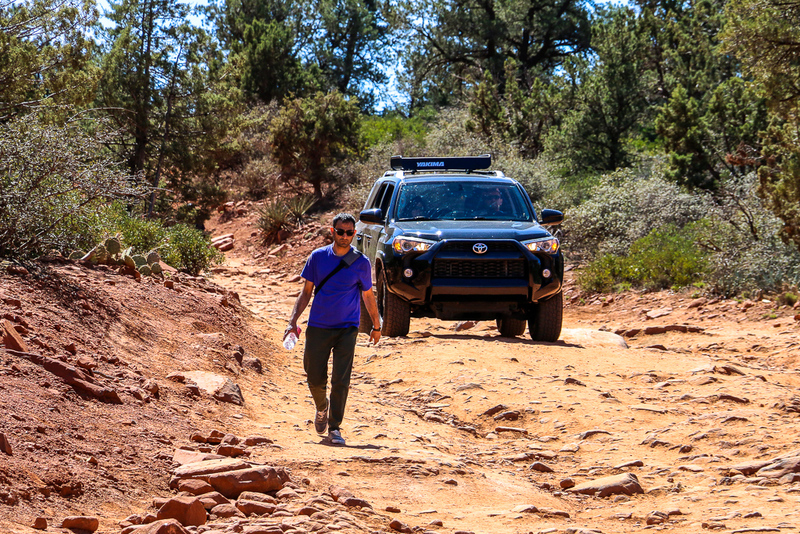 You might be forced to park so far away from the trailhead, that a walk to it can be easily substituted for an additional hike. The Devil’s Bridge Path starts off the Dry Creek Road trailhead. You can cover almost half of the trail in high clearance vehicles. Unfortunately, the uneven, rocky Devil’s Bridge Trail is completely unsuitable for low clearance vehicles. High clearance vehicles can go through almost half of the Devil’s Bridge Trail. About a mile from the parking lot, the Devil’s Bridge Trail turns to the right and gets narrower and steeper. After this point, the vehicles are not allowed on the path. Hiking the Devil’s Bridge Trail here also becomes more challenging. The path steadily goes up until it reaches the base of the bridge. From here, you will need to take a natural rock staircase that enables only one person to go through. Luckily, the hikers show full respect to each other and wait until a small group of people proceed to the top before they go down or vice versa. The difficulty of hiking the Devil’s Bridge Trail is compensated by gorgeous scenery. The deeper you go, the closer Sedona’s red rock walls become to you. So close, that you desperately want to run toward them. But obviously, this proximity is just a mirage. There is a long way to go to those scenic mountains. 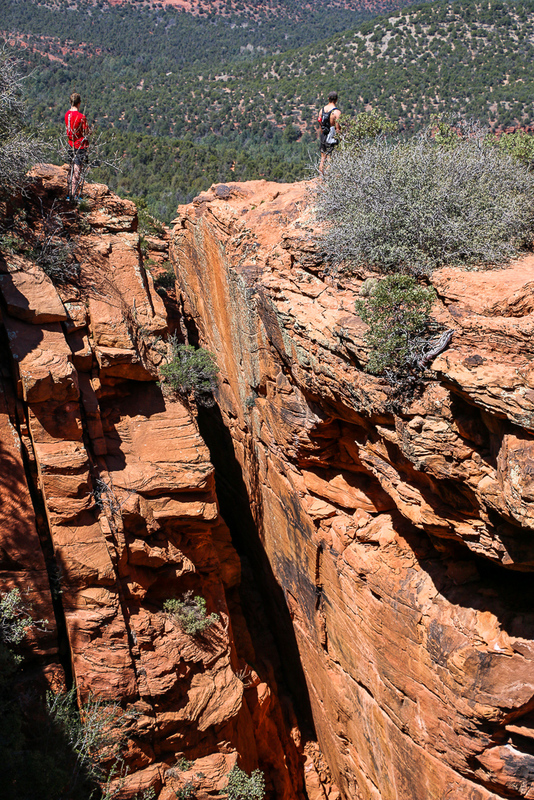 Pinnacle of the hike though is Devil’s Bridge, the largest natural sandstone near Sedona. The famous formation gets thinner toward the middle and creates a dramatic visual image that gave name to the place. In reality though, there is no danger involved. You can’t even see the bottom of the canyon unless you really try. Many hikers stops here to celebrate their successful walk with a series of photos on Devil’s Bridge. So often, you need to make a line in order to get your “minute of fame” on the bridge. Hiking the Devil’s Bridge Trail back to the parking lot is easier as you mostly go down. The whole trail is about two miles one way. There is neither entrance nor parking fees. But make sure to smear good amount of sunscreen and grab a bottle or two of water before hiking the Devil’s Bridge Trail. 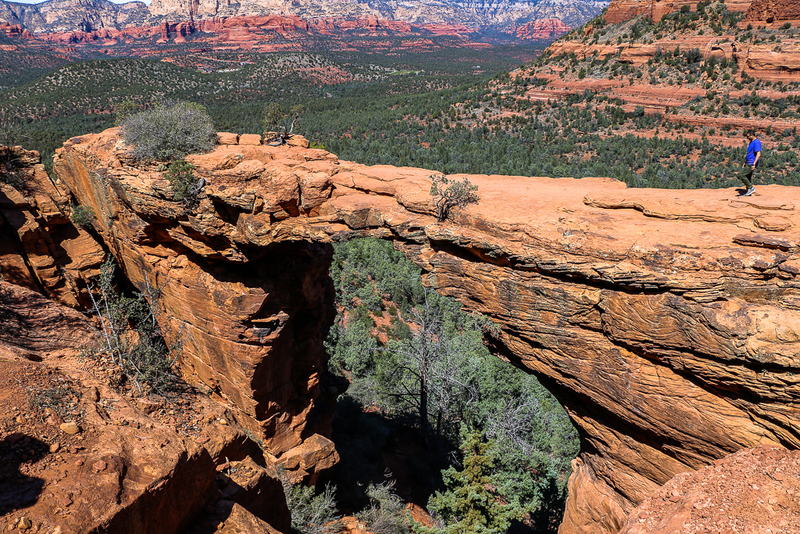 Devil’s Bridge is the largest natural sandstone near Sedona. 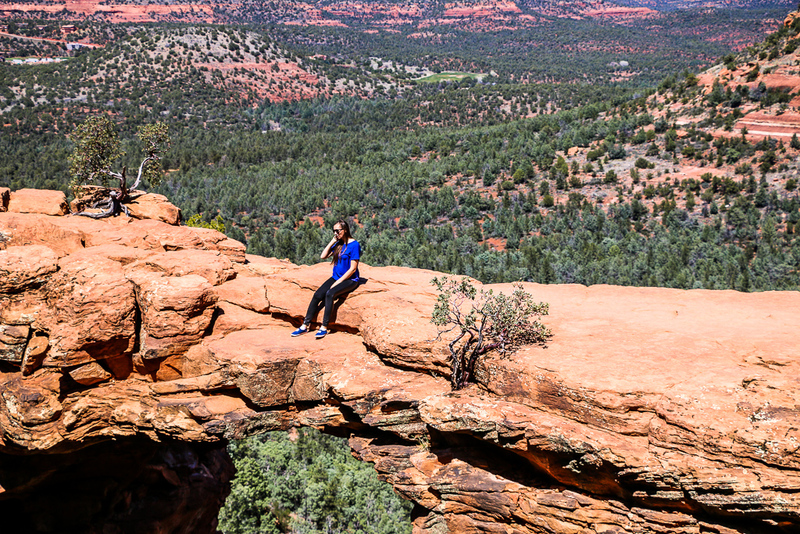 Many hikers don’t leave without taking pictures of Devil’s Bridge.